We’ve silently released a new generation of Fabman bridges. What’s changed? New power plugs make it easier to connect power, no matter what kind of wall sockets you country uses. New internal layout makes it easier to connect I/Os, if you need to. A more powerful chip gives us more headroom for future improvements. A second button. What for? For example, it offers a more convenient dead man’s switch – especially if you use your phone to switch it on! If members need to check-in at your space, they’ll sometimes forget. Now you can add their times to the log by hand – any charges are automatically created, if necessary. Similarly, if someone forgets to check-out at the end of the day, you can correct that as well. It’s a very simple way to charge for rooms, desks, etc. on a per-usage basis (instead of just recurring fees). 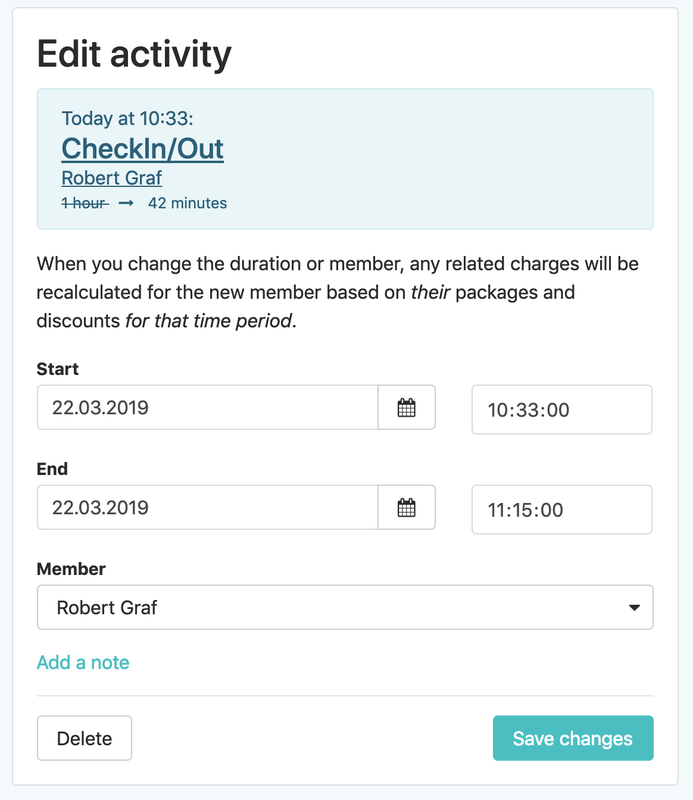 Add your room to Fabman, configure your rates and track usage times for each member to get automatic billing and usage statistics. You can charge for portable equipment that’s not well suited for a bridge integration: projectors, drills, etc. Of course you can also edit and delete entries, if you need to adjust something or made a mistake. The corresponding charges will automatically be updated. We’ve improved the UI and behavior of cancelled invoices to make them easier to understand. Invoices can now be sorted by number or amount, not just by date. The „Collect payment“ preview shows you who doesn’t have any payment method – instead of pretending that you can charge every member and then reporting „no payment method“ errors for those members without payment methods. You can delete individual entries from a member’s history of changes. It’s great for erasing sensitive information (or just cleaning up a bit). Do you have so many webhooks that it’s difficult to remember how each one works? Now you can add notes to each one, so you don’t have to keep everything in your head – or on sticky notes. You can now browse more than just the last five webhook events. How many more? All of them! Charge API: A new query parameter lets you fetch the charge that was created for a particular activity log entry. Members can be filtered based on which training courses they have attended. You can embed each member’s training courses when fetching a list of members. We’ve tweaked how we display a member’s details in the admin app. Why? To make things clearer and to create some space for upcoming features. Members are now warned earlier before a bridge switches off automatically: 60 seconds blinking + 30 seconds beeping instead of 30 and 15 seconds, respectively. When entering times (eg. for bookings, holidays, activities, …) you now get a proper time input field in browsers that support it – which is pretty much every browser except Safari on MacOS and old IEs. It makes it much easier to input times on mobile devices, but also gives you better keyboard controls on desktop browsers. Bridges let you configure whether your idle/busy inputs are idle-low, busy-high or the other way around. You can provide more ways for members to contact you: email, web & phone. Just go to you space’s settings and add your contact information. For now, these details are only shown in the member portal if you disable self-service – but that will change soon. Fixed a problem when changing the email address of a member while you have auto-invite turned on. Fixed an error when feeding the year 0000 into any of the date fields. Our input field for notes & descriptions misbehaved when editing headings in Safari. Some “notes” fields only allowed relatively short texts. Now they all accept as much prose as you need. Owners were shown as having „not yet been invited to create a user“ – which was nonsense, of course.